Thanks for some of that advice man. So I'm just wondering if anyone can help me understand what exactly to look for in an axle to make sure that it fits into my 97 XJ. Also I know the gears are reversed cut on the XJ, what vehicles could I work at getting gears out of. I'm just buying parts off of wall rigs on Facebook marketplace so I just want to know what to look for if anyone can help me with that. Thank y'all. You can pretty much fabricate any axle to fit under your XJ. It is just a matter of how much time/ability you have. If you only plan to run 33's in the near future I would look for a 29 spline 8.25 from an XJ and swap in a set of new 4.10 gears. If you are not experienced with gearing go ahead and pay someone else to do it. For the front end a cheap and relatively easy swap is to find a 4 cyl XJ in the junkyard and pull the front axle (d30 high pinion) as most of them came with 4.10 gears. You want to make sure you are getting the proper gearing with the donor front axle. There are plenty of videos on youtube that show you how to find/calculate gear ratio without pulling covers, counting teeth, or looking for stamps. Second option is keep your eyes out for people that have already built/modified a set of axle for an XJ, you may be able to find a lock or LS 8.8 with a matching geared front for sale cheap. Just take your time and don't just buy anything that comes up for sale. If you are planning to do it in a few months take the time to get the easier of parts to put under your rig unless you have the welding/fabrication/regearing skills to do the full build yourself. I am looking to buy a 94 Cherokee with quite a few mods. One of them is 33 in tires and a 4.88 differential. 6 cyl w/auto trans. Any problems with this. Going to toss mine in here. changed it to 3.55's and put the speedometer dead on accurate. I know I'm goin to have to regear my jeep sooner than later to 4:10, but how important will that be to do right away. Also I do drive the freeway a decent amount with it so I know it will need to be done. But this leads me to my next question. Once I buy the lift kit here in a week or so, the next thing on my list are new axles. Quite frankly i just am looking for advice on what axles I should be searching for and if there are requirement I need to know in order to tell if an axle will be functionable under my jeep, I've been looking mostly at d44s. Another thing I'm wondering is if I were to just replace my rear to say a Dana 44 (hypothetically), would I then need to replace my front to a Dana 44 also or could I keep the D30 and just have matching gears. And lastly, is there any advice I should have on the order I should install these, obviously I can't put the tires on until I have the lift but should I wait for a new axle before I put anything on. since this group chat is specifically about gear ratio and I don't want to get banned from the chat for talking about my axle and lift questions, maybe I can just focus on how well my jeep will run on 33s w 3.55 gears? I would try to find a Chrysler 8.25 and regear it with 4.56 gears and do the front Dana 30 at the same time. The chrysler 8.25 is a direct bolt in and you should look for one from a 96-01 Cherokee because they will have the 29 spline axles. You can just run the 33s with your current axles until you get all the parts together. Late to the party here. But I have something hopefully useful to add. When I was doing the gears in my XJ last year, I also figured out the math for the speedometer gear that you would put in the transfer case. I put in most of the tire sizes I could find and corrected for the fact that most tires are smaller than advertised. I color coded the chart to match the color of the gear when you buy it. 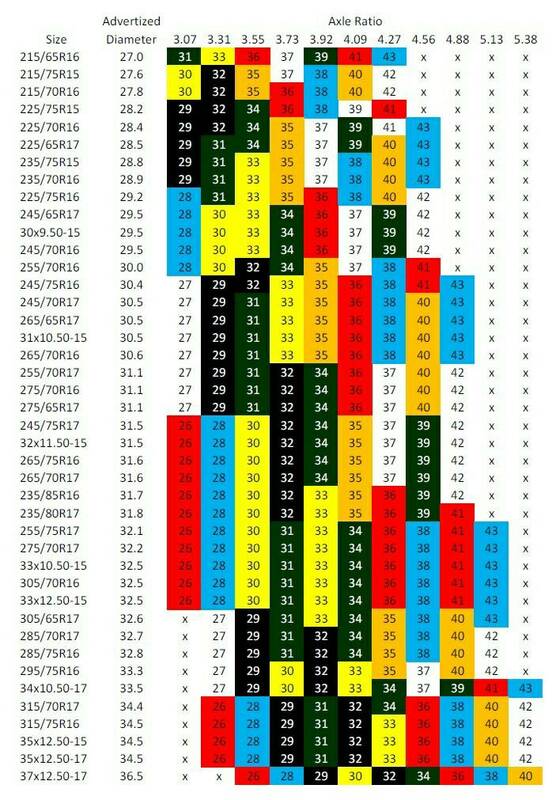 I'm running 31x10.50/15 tires on my XJ with 4.27 gears in the Grand Wagoneer Dana44 axles I stuffed under it and used this chart to pick the speedometer gear. My speedometer is just about dead nuts on to my GPS. Same with my J10 running 315/75R15 tires with 4.56 gears. Last edited by derf; 04-24-2018 at 04:53 PM. Better late than never, thank you for the info chart. Glad this thread is here. Installed 33's with 3.55's and she just doesn't have any steam anymore. Haha! What size tires do you plan on using? At least 33's? what is your lift height, tire size,overall weight of your rig? Thinking of jumping to 4.88’s myself with my aw-4. I am regearing my Dana’s to 4.10. 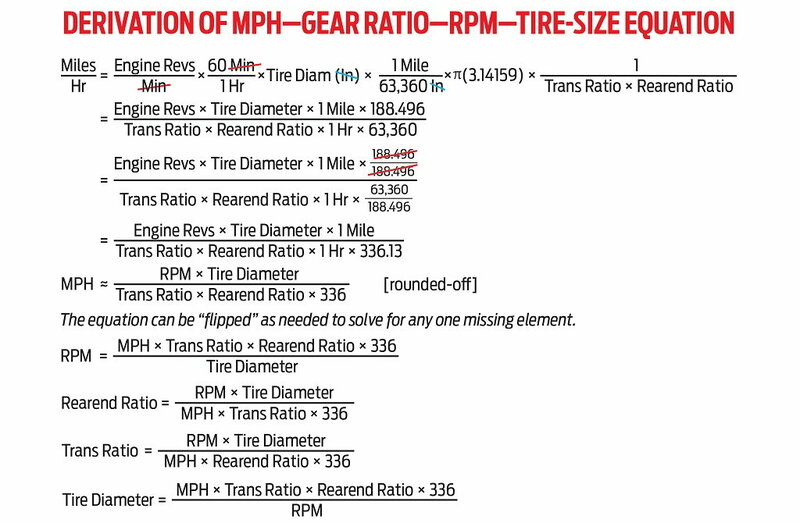 Looking at the tire size/gear ratio chart... with 31’s, will be running 2,896 RPMs at highway speed. But based on the quote above, will I be turning 15%-30% lower RPMs in 5th gear on the highway? RPM= MPH x transmission gear ratio x axle gear ratio x 336 divided by tire diameter. Thank you for the info! Very much appreciated. That calculator is awesome. 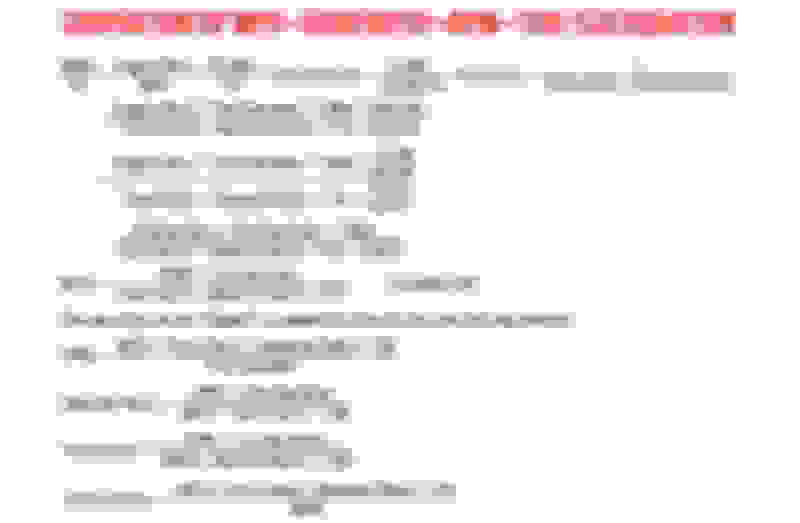 Last edited by Rlmx; 02-28-2019 at 06:49 AM.